L'Internationale was written in 1888 by Adolphe Degeyter (words by Eugène Pottier, 1871). Adopted by the Socialist International, it was once was one of the most sung songs in the world, rivaling Amazing Grace and Silent Night in international renown. The Bolsheviks made L'Internationale the Soviet national anthem. It remained so until 1944, when Stalin replaced it with the Hymn of the Soviet Union for reasons of morale. Battlefield reports indicated soldiers were more willing to die for Mother Russia than for any "international working class." 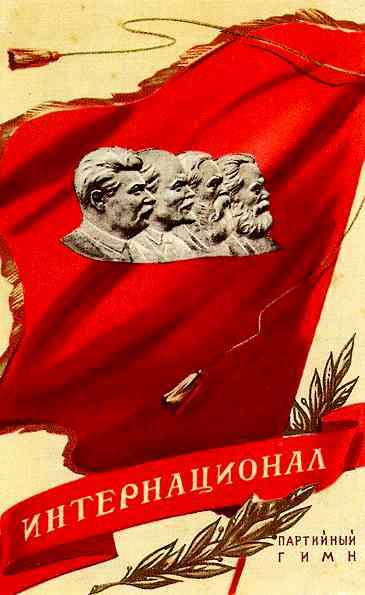 This 1944 poster celebrates the new Soviet anthem. In 2000, Sipos commissioned Tim Melton, an Arizona keyboardist/sound engineer, to record and mix Vampire L'Internationale (a variation of L'Internationale), according to Sipos's specifications. For several years, Vampire L'Internationale played whenever the homepage appeared. CommunistVampires.com has since outgrown its origins, but Sipos still has copies of the recording, if anyone wishes to hear it. L'Internationale is public domain, but the sound recording of Vampire L'Internationale is copyright 2000 by Thomas M. Sipos. Want a free listen? Amazon.com provides RealAudio excerpts from all of the below CDs, except for the French version. L'Internationale has been recorded in dozens of languages. A more symphonic Hungarian version appears on the Best of Communism CD (Vol. One). Entirely in Hungarian, aside from a brief Lenin recording that is (naturally) in Russian. 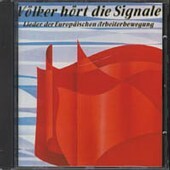 Völker hört die Signale offers both German and French recordings of L'Internationale. The French version is the longest of any listed on this site -- 6 stanzas. The German version runs 3 stanzas, as do the (above) Russian and (below) English versions. The (above) Hungarian version has only one stanza. Seems this French version is the most complete -- and in the original language. A giddy Frenchman sings the stanzas solo, the refrain sung by an ebullient chorus. English speakers wondering what all the fuss is about may be pleased to discover that Billy Bragg sings an English version on The Internationale. However, purists will be disappointed to learn that Bragg rewrote the lyrics. Thus does Bragg attempt to rehabilitate "L'Internationale," for unlike the producers of the Hungarian CD, Bragg still buys into the song's ideology. Included on his little CD (ca. 19 minutes total) is a paean to the Sandanistas. Actress Judy Davis hums and sings "L'Internationale" in Children of the Revolution. Davis plays an Australian Stalinist who meets her hero. Dead-on satire of the Western Communist "true believer." Also features the best film "aging" I've ever seen -- Davis and her family age 40 years (spanning 1951 through 1991), with no heavy pancake makeup. The supporting cast is also excellent.